Edson, F. & Kayombo, E.J. 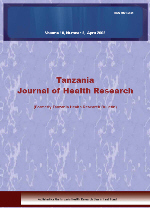 A school-based study was carried out to assess the knowledge on malaria and its prevention among children in Kyela District, south-western, Tanzania in August-September 2004. A total of 400 schoolchildren (age=10-20 years) from four schools were selected. A structured questionnaire was used to collect data on knowledge on malaria transmission, methods of prevention, source of information and use of mosquito nets. More than 85% of the respondents were knowledgeable on malaria and preventive measures. Sources of information about malaria and its control were mainly from their teachers (47.4%), print materials (21.9%), family members (20.4%), television and radio (7.3%) and medical personnel (2.2.%). The perceived best control measures were untreated nets (32.1%), treated nets (21.4%), environmental management (25.7%) and burning mosquito coils and insect repellents (20.8%). Availability of mosquito nets was relatively high (70%), but only 38% of the pupils were using insecticide treated nets (ITNs). Low ITN use was due to its unavailability (57.5%), cost (35%) and foul smell and fear of side effects (7.5%). These findings suggest schoolchildren are aware about malaria and its prevention methods, but are not well-informed of the benefits of using ITNs. More education and advocacies on use of ITNs to parents and children is needed.